Back today with Part III of the Fauxback Jersey Contest (if you missed Part I, which ran last Saturday, click here. Everything’s explained in that link, so I won’t repeat it all here. Part II was held last Sunday. You’ll see the four finalists from Part I following this post, and I’ll post Part II’s finalists with tomorrow’s post. Below are the third 25 submissions (in alpha-order), numbered and labeled with the team (and year if applicable) the concepter is throwing back to, as well as a description, if provided; following the submissions, we’ll have voting. As you scroll through the graphics, be sure to make note of the concept(s) you like ”” you’ll be able to vote for as many as you like (but you can only vote once). You guys know the drill by now (click to enlarge, etc. ), so let’s get started! My submission is an imagining of what the Anaheim Duck’s jersey might have looked had southern California been awarded two expansion franchises for the 1967 season instead of Oakland getting the California Seals. My entry is a 1976 throwback for the Arizona Diamondbacks that I’m calling “Phoenix Sunset,” as a tribute to the main inspiration, the classic Houston Astros tequila sunrise. I’ve tried to include multiple throwback elements including a TV number on the left sleeve, the two-button pullover construction, and playful curved typeface for the main word mark. The main visual is based on the state flag of Arizona; I credit my wife for reminding me the sun on the flag is replaced by a copper star, which I’ve included into the design as a pass-through from the front to the back along the left side. The sleeve patch on the right sleeve is a copper baseball diamond with a coiled snake hissing below the AZ lettering. Attached is the 1975 Diamondbacks jersey drawn by my 10 year old son, Elliot Miller. He was very excited to submit this creation! Attached is my 1976 San Jose Sharks fauxback design. I like to think this would have been a 1970’s representation with added bicentennial stars around the sleeve numbers (which would have been a 1 year thing) Notice NO BLACK. This is way before BFBS! The 1982/83 Oklahoma City Thunder sported one of the most unique jerseys in NBA history. Featuring a striking lightning bolt design and an eye-popping sky blue, sunset orange, lightning yellow, and cloud white color scheme, this road jersey has become an ironic (and sometimes unironic) fan favorite in recent years. I figured I would send you my idea of what the Arizona Diamondbacks would look like if they where founded in 1980 instead of 1998. Colors are based on the original D-Backs colors (sans purple) , and “threwback” the logos. lettering, and numbers; in a style prevalent for the time. Taking inspiration from the old NASL, I wanted to see what the New England Revolution may have looked like in 1976. I couldn’t think of a more fitting year than America’s Bicentennial. The 1965 Florida Marlins sport a cream colored, vested jersey, featuring orange piping around the neck and sleeves, teal undershirts with team patches, a Miami art-deco style logo and era-approprate NNOB. Using the Mallard as inspiration, I picked Forest Green, Athletic Gold, and Purple for team colors, and made the collar white to replicate the ring around the Mallard’s neck. I designed a Mallard logo in a 1940s logo style and kept “Mighty” because adjectives in team names were more common. An alternate past””1977, 40 years ago””where the Diamondbacks shared the same colors as their Phoenix counterparts, the Suns. The design features a pinstriped pullover that places it within the style of the times with a nod to their actual jerseys from the 90s through today. If the Jacksonville Jaguars had existed in 1963, I’m guessing they would have the simplest uniform imaginable: white shirt, white helmet, black pants. No design at all, even on the helmet. Too bad the pendulum has swung the other way in the last 50 years. my washington baseball club fauxback. I used to love the nats script on the syracus nationals, and so i tried to combine that with the current alternate design plus the classic senators W.
I chose to create a 1961 Minnesota Wild fauxback. Presenting the 1977 Florida Panthers of the WHA. From an alternate history where Miami Dolphins owner Joe Robbie purchased the World Hockey Association’s Miami Screaming Eagles franchise rights and based them out of the Hollywood Sportatorium, adopting the doomed effort’s team colors (and it’s high-profile player signings), but changing the team name. Because a Sonics throwback is not happening, I took the Thunder back to 1975. Muted the current blue to a sky blue that was used heavily in the 70’s across sports, used an era appropriate woodmark font and created a themed number housing inspired by Golden State during the period. Had the Washington Nationals existed in 1976, surely they’d have adopted a special jersey to celebrate the Bicentennial. I’ve included tequila-sunrise-esque stripes, stars, and a W based on the text of the Constitution. Since it’s a modern-day fauxback, it’s powder blue for use at home. And there you have it ”” the third group of entries for the Fauxback Jersey Contest. Voting is below (remember, you can vote for as many designs as you’d like, but you may only vote one time). Let’s have a big hand for the third set of contestants. Let them know what you think (and maybe even lobby for your favorites) in the comments below! …in the Fauxback Jersey Contest. I’ll have the results of Group II, and the second four finalists, tomorrow. My name’s Garrett Beatty and I’m a sophomore in high school. Funny story: I actually made a faxback jersey for the Royals and didn’t realize the year rule until after I finished. But here’s a Jacksonville Jaguars one. If I do win, is it possible to get the jersey in the long-sleeved version? If not that’s fine. Made a long sleeved and normal sleeved version of the jersey. For the 1976 season the Marlins introduced the legendary “collared” jersey. The style was popular among the players and fans and remained unchanged until 1980. The Chicago White Sox attempt with a similar jersey style proved a disaster and was quickly abandoned. Congratulations to the finalists, and thanks to everyone who participated! ESPN reminder: In case you missed it, Paul’s latest ESPN piece features 10 things you might not know about the Astros’ classic rainbow uniforms. Check it out here. Naming Wrongs reminder: Over on the Naming Wrongs project, Paul has made some adjustments to the wording of the Murph and Ted shirts, and has also added several new Rose Garden shirts. Full details here, or just go straight to the Naming Wrongs shop. 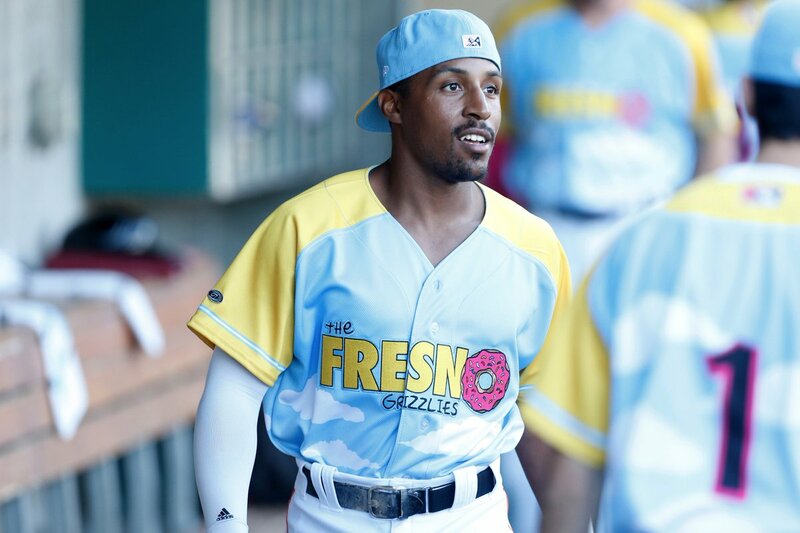 Baseball News: To celebrate Canada’s 150th Anniversary, the Winnipeg Goldeyes wore these Canada-themed jerseys versus the Sioux Falls Canaries last evening (via Paul, from Andrew Collier). … “My college, the University of Illinois Springfield recently switched their baseball park infield from grass to turf and it really shows off the logo around home plate,” says Erik Fowler. Here’s a look at the new infield. 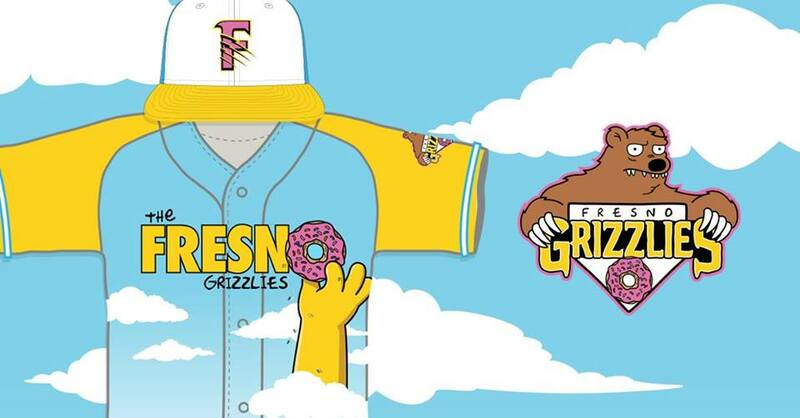 Erik continues, “This tweet shows the work being done, and lastly this one shows a after and before shot.” … Friday night the Fresno Grizzlies (one of my fave MiLB teams, donchaknow) wore these Simpsons-themed jerseys & caps. Mmmm, donuts. Here’s another look. … The Brooklyn Cyclones will be wearing Captain America jerseys tomorrow. … Here’s a neat graphic on Knack of Batting and How to Select and Care for Your Bat. (ca. 1920s) (from 216 Sports History). … Listen to Vin Scully recite the famous Field of Dreams speech (from Nik Faroe). 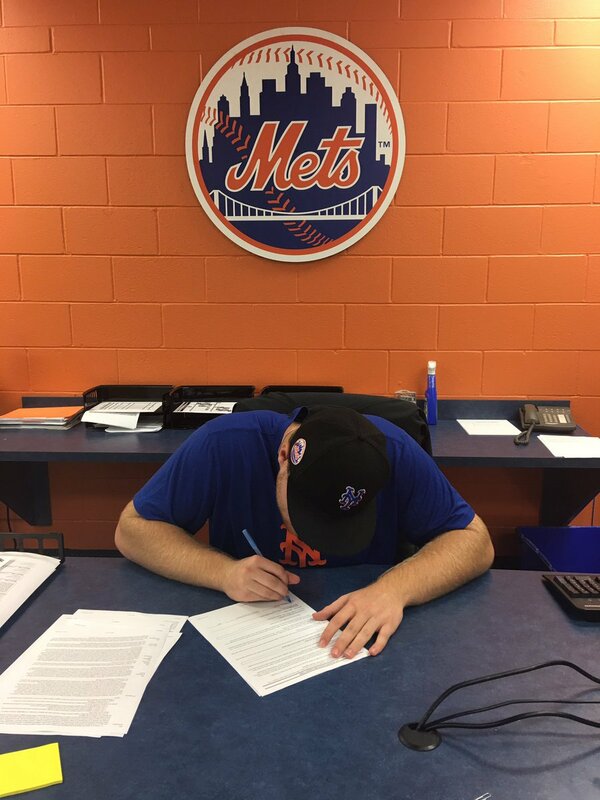 … A couple people noticed this the photo (from a tweet) and remarked on the black cap Bryson Hutchinson”, a newly signed ball player in the New York Mets organization, was wearing. The Mets haven’t *technically* had that cap as an option since 2011 (though it was worn a couple times in 2012). … Like almost all MiLB teams, the Columbia Fireflies are wearing patriotic caps for the holiday weekend (these will be worn July 3). From Daren Stoltzfus. … Last evening, the The Memphis Redbirds threw back, returning to Chicks nickname. Here’s how they looked on the field (h/t Logan Ballew). … The love for the Houston Astros’ tequila sunrise unis remains as strong as ever. … As most of you (I hope) know, today and for the next three days after that, MLB teams will be wearing flag desecration unis, which also means custom shoes for many (from Paul Murphy). 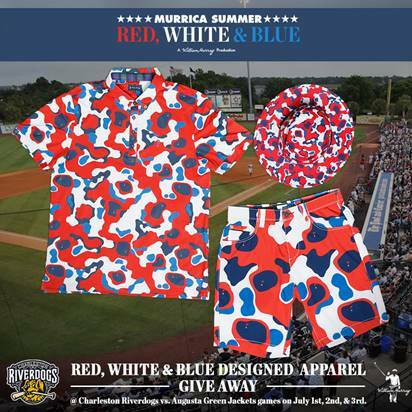 … Yowsa, the Charleston River Dogs are giving away these red, white and blue … items this weekend (from Scott Weiss). … Here’s the uniform the Great Lakes Loons will wear on Monday for Military Appreciation Night (from Great Lakes Loons). … The Rochester Red Wings will be sporting these *patriotic* jerseys & caps on Independence Day. … Mike Sullivan got himself a new BoSawx cap and immediately performed a NewEra-putation on it. … The Staten Island Yankees will wear these jerseys for tonight’s Women in Sports Night. … It’s come to this: The A’s are doing a Turn Back The Clock game — for their BLACK jerseys (from Landry E. Heaton”). … Here’s a look at the Arizona D-bax uni tracking for June. 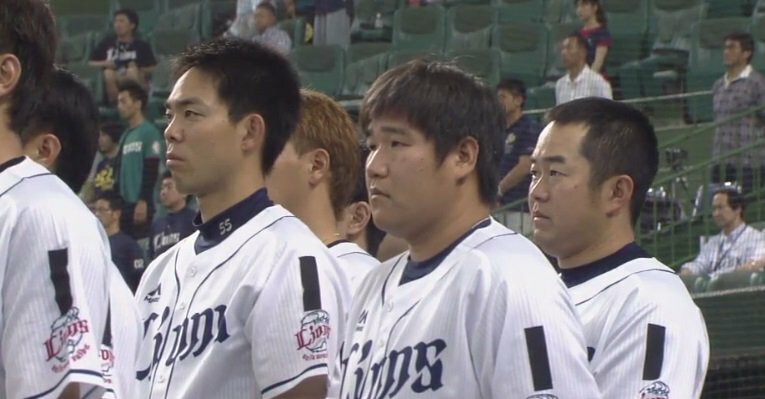 … The Seibu Lions added a black stripe to their unis to remember the late Shinji Mori, a pitching coach who died this week (from Graveyard Baseball). … If you look closely and squint, the Brewers Ball in Glove logo almost looks like the state of Wisconsin (from Robert Hayes). … The Braves went with the home cap last night on the road. “Haven’t worn this hat on the road since 2008 I believe,” says smoresarefun. 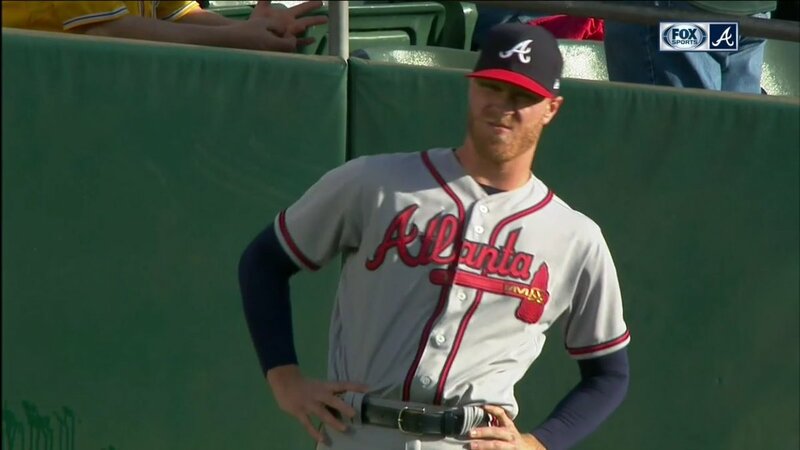 … Reader Mitchell Barbee also noticed this and said “The Braves wore their red-billed cap on the road for the first time since 2009 (I believe), but wore their standard road caps for BP. No matter when they last wore it (maybe one of our Braves sleuths/trackers can confirm when the last time was), it’s been a while. 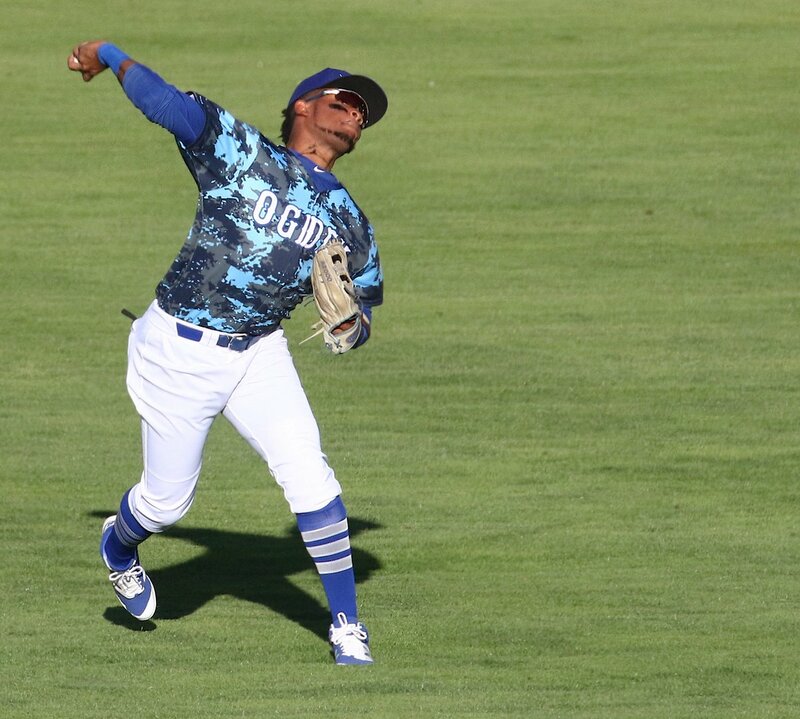 … LA Dodgers affiliate the Ogden Raptors wore new digital camo jerseys for the first time last night (from Brett Hein). NFL/CFL/College/High School Football News: Our ACC Tracker Rex Henry spotted this NFL/No Canada sticker on a car (and also on the front door of a house). Not quite sure to what it’s referring. Scott Lunn may have the answer, “It is. Made by @store716 when Bon Jovi buying and moving the Bills to Toronto was a topic of discussion.” … As you’re all probably aware, the Arizona Wildcats unveiled new uniforms earlier this week, and not everyone is in love with them. … Here’s a look at some of the shoes the UNC Tar Heels will wear this fall (from James Gilbert). … Nike opposes Rob Gronkowski logo, says too similar to Jumpman (from Mike Chamernik). … Here’s a good look at Colorado’s football combos for the upcoming season (h/t Broc). … Last evening, CFL refs were wearing red/white stripes for Canada Day games (from Liáµ±schitÉ€). Here’s another look. 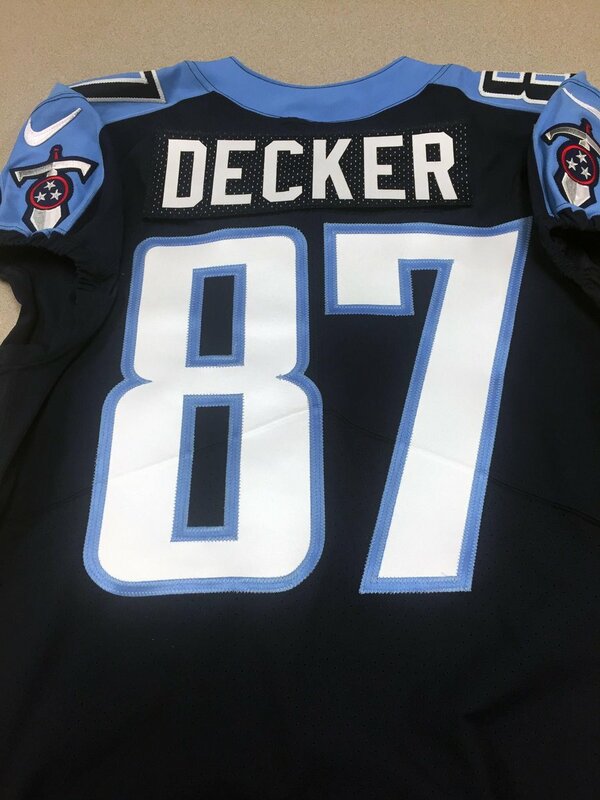 … Yesterday, the Titans tweeted out this picture of Decker’s jersey. 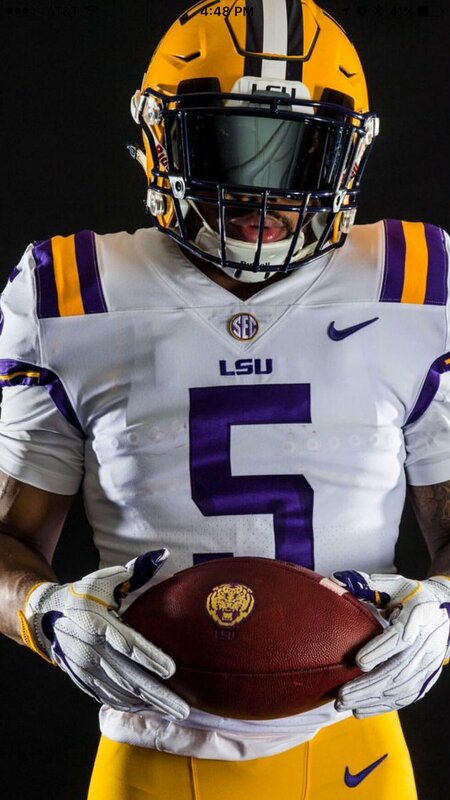 Submitter Casey asks, “What’s up with the dots on the nameplate?” … “LSU ditched the Nikelace for the new template,” says Broc who adds, “Naturally the shoulder stripes are back to normal.” Here are some comparisons (from Cameron Lewis, and even more from Evan Saacks. And here’s a look at the back (Broc again). … The Toronto Argonauts wore mono-blue on Friday night. Submitter Wade Heidt adds, “In addition, they unveiled a larger ‘A-shield’ logo on their blue helmets than in the past. The ‘A-shield’ logo on the blue helmets now matches the size of the logo on their white helmets. NBA/G-League/College/High School Basketball News: Remember when Michael Jordan sent Bugs Bunny and Daffy Duck to his house to pick up a pair of Air Jordan 9s and his lucky UNC shorts to wear for practice in the 1996 film Space Jam? Well, Jordan Brand Is Releasing MJ’s Famous Practice Shorts from Space Jam (from James Gilbert). Soccer News: Here’s the leaked Shakhtar Donetsk 17-18 Home kit by Nike (from Ed Å»elaski”). … English League Two club Notts County have revealed their new Puma kits for the 2017-18 season. They will have, wait for it…TEN different advertiser options. 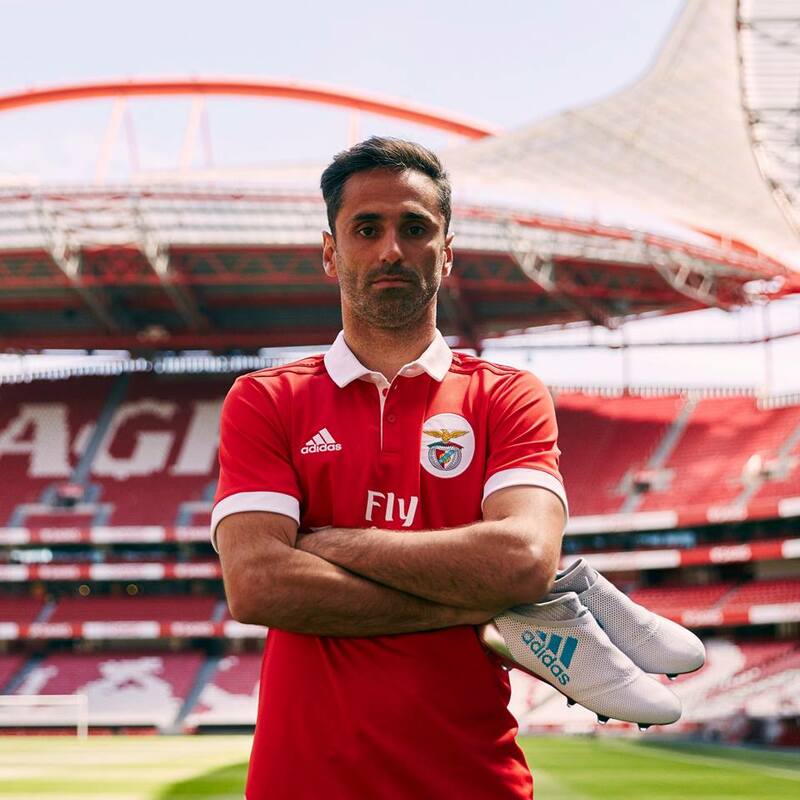 … SL Benfica” has a new home kit (from Mike D.). … Here is a list of all 523 Premier League shirt sponsors, by industry/category. The 2017-18 season will be the first without a beer sponsor in league history (from K Berard). … Speaking of the Spurs, Tottenham has announced a multi-year partnership with Nike (h/t Brinke). … Here’s a short video on that (from James Beattie). … Edward Ford writes, In Italy, got my first look at the @juventusfc shirt with new logo today! … adidas Soccer and AC Milan revealed a new design for the club’s 2017/18 season away jersey. … Here’s a look at the new Juventus Away Kit (from tonyjuve10). … New home and alternate jerseys for Sporting Clube de Portugal (from Joey Bertao). … Was Atletico Madrid’s new jersey leaked online? And that’s it for today. Thanks to everyone who submitted for the Fauxback Jersey contest. If you haven’t already done so, don’t forget to vote for your favorites! I’ll have the fourth (and final) set tomorrow. As a braves fan, I am so incredibly happy to see the braves wear their red brimmed hats with their grey road uniforms. They started wearing the all blue hats on the road after they introduced their navy uniform, and I’ve always hated that they changed for the grey uniforms. The red brim matches so much better with all of the red on the grey uniform. I concur. Those all navys don’t match all the red trim on the unis. Agreed. Never should have went away from the red-brimmed cap. Makes the whole uniform pop. No offense to the first two rounds, but I already see 6 to 8 designs I like better with this batch. Too bad the contest is set up the way it is. Some way cool designs are going to be left on the table. 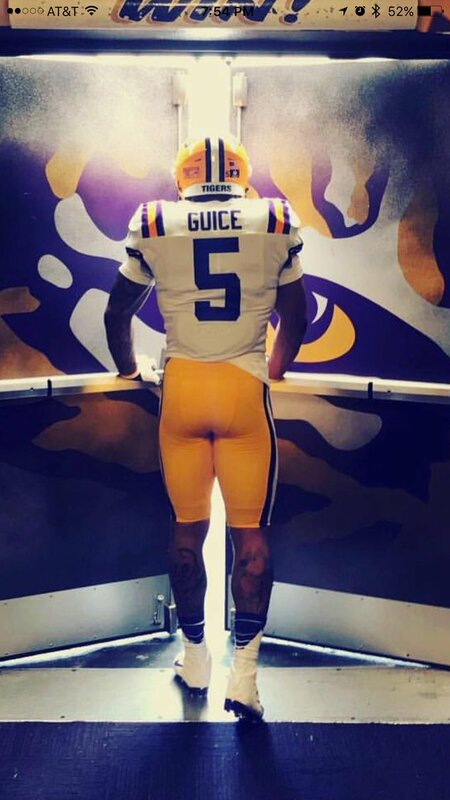 LSU shoulder stripes = downgrade. The traditional style is for it to wrap around, not stop halfway. Very bad look. Agreed. It’s almost as though the guy was being sarcastic by saying the shoulder stripes were back to “normal”. I too agree. As an LSU fan I wish they’d just leave well enough alone. I also agree. Similar situation with the Indianapolis Colts current uniform being a bad version of the original Baltimore Colts uniform. In honor of Canada Day, here’s some notes from my recent visit to the great white north. It’s sad, but some people don’t realize what a big world it is. They don’t see how much there is to learn from other cultures. Me, I’ve never shied away from exposing myself to foreign ways of life: From drinking margaritas in Key West to riding the teacups at Disneyland, I’ve been a lot of places and seen a lot of things. But when I took a trip to the Great White North last month, I had no idea how much it would broaden my horizons and open up my mind. Have you ever been to Canada? If you look for it on a map, you’ll realize it isn’t far from the United States. But once you cross the border from America to Canada, you’ll immediately know you’re in a foreign land. Case in point: the food. While I was in downtown Toronto looking for a place to eat, just something simple like a McDonald’s or Hardee’s, I came across a restaurant I’d never seen before called Mr. Sub. I figured, “Hey, when in Rome…” And you know what? My open-mindedness paid off! It was a sub shop, but it had a breaded-fish sub. I’d never seen anything like that in a Blimpie or Subway. I guess those Canadians really like their fish. In the end, I got a “Great Canadian Sub” so I’d get the full Canadian experience. And guess what? It was great. Just goes to show what can happen when you leave yourself open to new experiences. Something else that’s a little strange about Canada is how they don’t use pounds or miles or inches. Everything is metric. I remember learning about the metric system in chemistry class, but this is an entire country that measures everything differently. That’s the sort of thing you only learn by actually going out there into the world. Another thing that really gave me pause was seeing road signs in French and English. The first time I saw a bilingual sign, I didn’t know what was up. But the Let’s Go Toronto guidebook said that a lot of Canadians speak French as their first language. How odd is that? As I soon learned, the French colonized a lot of Canada instead of the English, so not only did I get some French culture, but I got a history lesson, as well. That’s why you take trips–to learn a little bit more about the world around you. The names are too similar. The parent company of Hardee’s operates their restaurants in Canada as Carl’s Jr.
Hm, those blue MiLB caps with red brims, are actually kinda cool. They look like 80s stone washed jeans. Too many good choices this round. But those Sharks sweaters really seem to capture the era for me. If they wore kelly green full-time, I wouldn’t be rolling my eyes into the back of my head. Their current green is almost black as it is. Lighten up, Athletics! Or should I say, “Brighten up!”? Oklahoma City 1983, take a bow. My favorite thing I’ve seen all contest, and what inspired me to actually vote for something. Vertical design harks back to the Dr. J Nets and the Cincinnati Royals (actually the Thunder had an all navy set that was kind of a boring dud), but that bolt sets it apart as an appropriate design motif, the colors work well, the fonts are traditional and therefore clear, and no gratuitous dark color that would otherwise muddy it up. Well done. Lots of great entries today. In particular I like Peterson’s Marlins, Miller’s Thunder and Martinez’s Diamondbacks (bonus points for using the full name!). Phil, A question after reading about the new Arizona uniform. Who pays for all these uniforms and helmets. Are taxpayers helping to foot the bill for half a dozen uniforms for a state funded school? Oops, wrong message, meant for one earlier. It’s part of the deal Nike signs with the school. Nike pays the school and provides a set dollar amount in gear for the right to use the students as human billboards. The schools make millions of dollars from their athletic apparel contracts, while the players get some shoes and gear. Today is Bobby Bo day for the Mets. He gets his 1 mill plus. The Madoff Mets cough up $30 million to avoid paying $6 million. How on earth was Wilpon permitted to keep this team? Criminals. They were involved. They deserve to pay him. (Payments end in 2035). They should be doing time with Bernie. Matt Medium’s Sharks concept is awesome. So…Wilson Ramos? Is this a faux-name or did the former Nationals catcher submit a Nationals faux back? ALSO: Holy crap, Derek Reese’s Florida Panthers WHA treatment. That better make it to the next round. It’s funny how they rip on US teams wearing Stars and Stripes, but have no issue with Canadian teams putting on Maple Leafs for Canada Day. I like how Paul rips on sponsors and logos from manufacturers while plastering his site with all kinds of sponsors. Who knew Paul Pierce was a uniwatcher? Those Thunder fauxback jerseys make this Sonics fan die inside a little bit. Throwbacks to the Memphis Chicks? Will we see other native American imagery given throwback uni treatment due to the recent supreme court decision? This morning, I watched the Friday 6/30 episode of Jeopardy! off of the DVR and Alex Trebek came out wearing a pseudo-hockey jersey for Canada’s sesquicentennial with ‘1867’ and ‘2017’ on the sleeves and ‘150’ on the back. He wore it throughout the first segment, and then changed into a suit jacket after the first commercial break. You have to phrase that in a question. I vote for the first one. Anaheim mighty ducks!! !